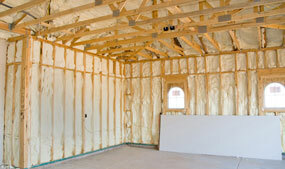 Download the spec sheets you need for your next insulation project. Below you will find all the information you need like R-Values per inch, Core Density, as well as 3rd Party testing results. If there is a document or a specification you are unable to find, please contact us at 1-800-853-1577 and we'll be happy to help you get what you need. Warranted by ThermoSeal, LLC when installed by an authorized installer using factory trained applicators. Download our Builder's brochure and learn how ThermoSeal can help you build a more energy efficient structure. 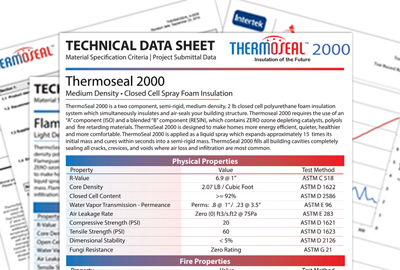 Technical Data Sheets contain detailed information on Thermal performance, R-Value, Water vapor permeance, water absorption, burn characteristics, comprehensive tensile strength, viscosity and weights. 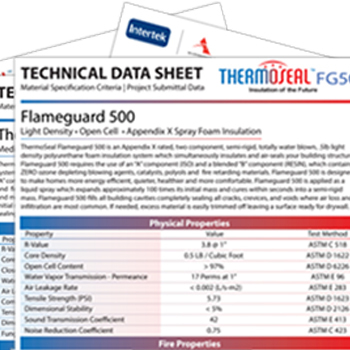 The safety data sheets contain technical information about chemical composition and information on ingredients as well as identifying hazards. You will also find fire fighting measures, accidental release measures as well as other safety related information. 3rd Party evaluation reports on Thermal and Moisture protection like ICC-ES. These reports evaluate ThermoSeal properties such as surface burning characteristics, physical properties, thermal resistance as well as other properties. Below are ThermoSeal product specific warranties. Limited Lifetime Warranty is applicable when applied by any authorized contractor using factory trained applicators and applied in accordance with the foam product's specification as stated on the Product Technical Data sheets. You can also find an Authorized ThermoSeal contractor on the find a local insulation installer page. Application form to be completed and sent to ThermoSeal no later than 5 days from completion.